For overseas orders, prices on request. 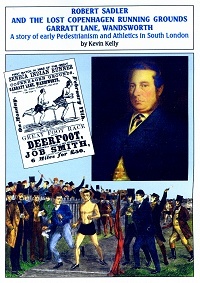 Many years of research by Kevin Kelly has resulted in a book on the history of the prominent athletics track in Garratt Lane Wandsworth between 1853 and 1864 and the story of Robert Sadler, the man who started it all. The exact location of the track had been lost in time as it had never appeared on a map but this is now revealed together with a previously unpublished image of the founder. During its life the track hosted over 500 events and virtually all the top pedestrians of the era competed there including the legendary Deerfoot. It is a soft backed book of 80 pages with a similar number of illustrations. Following Warren's biographies of Jack White and Teddy Mills, he has now published in the same format that of Sydney Thomas 1868-1942. The flavour of the book is born out at the start "In 1908, as London hosted the Olympic Games, a 'down and out' man destined for the workhouse was to be seen in Lurline Gardens, Battersea making attempts at singing and inviting passers-by to give help. 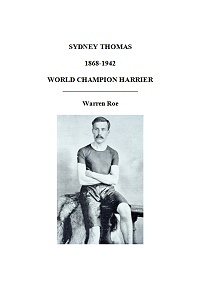 This man was Sydney Thomas who not many years before had been a brilliant athlete, breaking records in front of vast adoring crowds and winner of numerous championships both in Britain and America. This is his story." If you are interested in purchasing a copy a cheque for £4 (Euro 5 banknote from Europe) to Warren at 36 Ravenscourt Grove, Hornchurch, RM12 6HS will cover the cost of the book including postage. 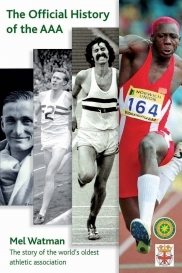 A new edition of the pioneering 2007 work expands the book to 458 pages, increases the number of countries covered to 36, adds 5 more years worth of records, and adds extensive additional information form national records expert Gjörgy Csiki and female athletics expert John Brant. The book lists all known progressive records in Olympic events for the countries featured, including for example, more than one jump or throw in a competition, where they were both or all national records. In addition to the main 36 countries, there are the top 30 records for each event as at 1940, 1960, 1980, 1990, 2000 and 2012.
by Bob Phillips and David Thurlow, a “Track Stats” Special, published by the NUTS, available from , 40 Rosedale Road, Stoneleigh, Epsom, Surrey KT17 2JH, cost £8 UK, £10 overseas. 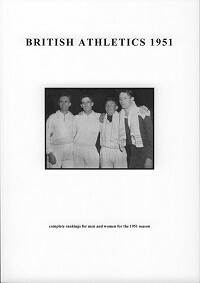 This 86-page A4 book, which is a very detailed exposition of the 1912 domestic season and the British experience at the 1912 Olympics, elaborates on some of the themes in “Britain and the Olympics 1896-2010”; namely the distaste of many in Britain for the Olympic movement, the feeling that the Games were being taken too seriously by other countries, and a belief that the professional approaches being adopted elsewhere were inimical to the Victorian public-school idealism of amateurism still prevalent at the top of UK sport. So, while the USA and Sweden were among the countries who organised themselves in a very systematic manner, the British approach was “haphazard”, with the official trials on 18 May being arguably less important than the Oxford v Cambridge match on 23 March. 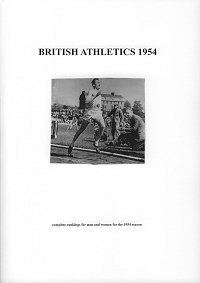 The authors, however, concede that one of the winners of the Varsity Match, miler Arnold Jackson (4:21 2/5) – who then did not compete again before the Games – won the Olympic 1500 metres title at 3:56.8! Maybe the maligned selectors knew something after all – or maybe excellence shines through whatever the circumstances? The authors list the team chosen for the Games – including a number who did not compete for various reasons – and the officials and journalists that accompanied the party. Like the BBC today the press-box was full of talent, including Walter George, Joe Binks, Guy Nickalls (a 1908 rowing champion in the eights) and Sam Mussabini. The daily reports of the meeting are very interesting. Fashion at the time was for numerous heats with small fields – in the 100 metres there were 17 heats for 69 athletes – and there were no false- start rules so one race got under way after nine false starts. As inexplicable was the decision to run heats of the 10,000 metres on 7 July (30 athletes) with the final the next day! Generally, though, the Games are considered to have been very well organised by Stockholm and Sweden. Aside from Arnold Jackson, Britain’s other gold medal came in the 4 x 100 metres relay. The circumstances were bizarre. There were only eight teams, but the organisers had six heats (so four walkovers) and three semi-finals. The first semi-final (only winners to make the final) was won by USA with a world record, but they transgressed with the baton-changing so Britain, who passed the line 2nd, made the final. The other semi-final winners, Sweden and Germany, both set (legitimate) world records. 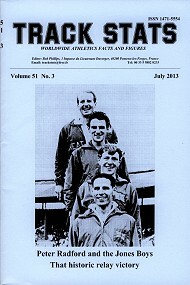 In that final, on 9 July, the British team of Willie Applegarth, David Jacobs, Henry Macintosh and Victor D’Arcy upset the odds by winning in 42.4, just a tenth outside Germany’s world record set in the semis. 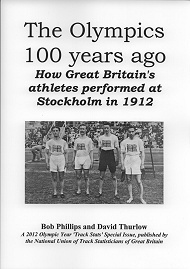 The book concludes with a review of the athletics proceedings by “The Times” correspondent (who ignores field events altogether) and a feature on the history of the 4 x 100 metres relay at the Olympics by Dave Thurlow, before concluding with ex-MP Robert Lehmann’s hostile views on Olympism, as expressed in 1912 in a speech reported in the Manchester Guardian. This book is truly a fascinating insight into a very different era to today. And has a number of useful illustrations. 1912 is also the centenary of the IAAF so a celebration of the Stockholm Olympics is extremely appropriate. by Bob Phillips, published by Carnegie Publishing, Chatsworth Road, Lancaster LA1 4SL, telephone 01524-840111, www.carnegiepublishing.com, cost £12.99. Unlike books that described the Olympic champions in alphabetical order, Bob Phillips covers achievements in chronological order. There are advantages to this approach, showing sequentially some of the changes in how the Olympics were run and how the gold medallists trained over the years since 1896. 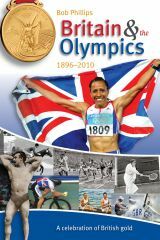 The book encompasses Olympic champions across all sports – and even people who may not have been 'Olympic champions' at all! At first glance “2010” in the title sounds like a misprint – but Bob is covering the Winter Olympics as well as the Summer Games, thereby bringing many different champions to the fore, from the 1924 curling team gold medallists (only formally acknowledged as Olympic champions in 2006!) through to Amy Williams, who won the skeleton bobsleigh in 2010. I doubt I’m alone in being most fascinated by the early Olympics (up to World War One) – Games of “idiosyncrasies, eccentricities and anomalies”. In 1896, for instance, there wasn’t an official British team, but individuals entered in their own right (and many top athletes at home would not have known the Games had taken place). In 1900 Britain won the “Over 20 Tons Class” yacht race – but many of the individuals in the crew are still not identified. In 1904 Tom Kiely won the all-rounders' event in St Louis but entered privately and as an Irish Nationalist would not have welcomed being called a Brit. In fact, it took many years for this event to be declared an 'Olympic event', such was the confusion surrounding many events in these early Games, which took place over many months and by no means followed a rigorous timetable of competition. Great Britain gave so much to the development of Victorian sport, especially in establishing and organising great sporting events, codifying rules and promoting sport in ways that encouraged people to flock to these events and see the star performers. Yet it is evident with the early Olympic Games that Britain was struggling to reconcile its position in the modern sporting world, and had conflicting attitudes towards the Olympics. Many in officialdom did not take the Games seriously and were suspicious of any hints of professionalism, but the world was changing. Bob Phillips records that even before the 1912 Stockholm Olympics had started the correspondent for “The Times” was comparing unfavourably the “extraordinary thorough work” preparing the Swedish athletes with the “gay, happy-go-lucky ways” of Britain. Bob neatly contrasts all this with the 21st century Games, with big money and a highly professional approach driving the success of Britain’s cycling team in 2008 (eight gold medals out of a total of 19 golds – itself a record since 1908’s exceptional total of 56 golds). I liked in Bob’s review of the 1930s the coincidence of the walking successes of Tommy Green (1932) and Harold Whitlock (1936) with the mass trespass of Kinder Scout in 1932 and the establishment of the Ramblers Association (1935) – truly walking “was a national pastime that could even make headline news”. All sorts of athletes had a Sunday morning constitutional, including Bill Roberts, the 400 metres runner. This book is heartily recommended for its great stories of wonderful legends of the past, its many excellent black and while and colour photographs, and a most valuable Appendix of miscellaneous achievements. This reveals, for instance, that of the 482 gold medallists (NB not a complete total as those sailing champions in 1900 are not known) at least 40 were born outside Britain, while at least 56 champions of other nations were born in Britain, including many Irish-Americans pre-Partition. Nationality has always been a highly fluid concept. Finally, the Olympic champions who might not be. They were professionals who competed in their own class of events in 1900 in Paris. They included Edgar Bredin, winner of three “titles” as a professional. Ironically nowadays it’s the professionals who dominate the five ring circus. The Amateur Athletic Association, founded in 1880 during a meeting at the Randolph Hotel in Oxford, was for many years the world’s most influential governing body for track and field competition. It was the AAA which established the rules and ethos of the sport. 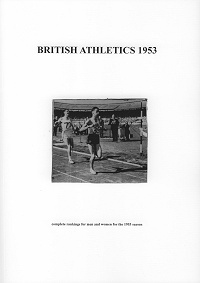 In this official history of the AAA, Mel Watman – who attended his first AAA Championships 60 years ago – brings to life the personalities and events which shaped athletics from its Victorian origins to the present day. Highlights of each of the prestigious AAA Championships from 1880 onwards are included in this sumptuously illustrated book. 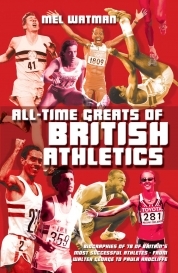 All the great names of British athletics are featured, from the 19th century’s most phenomenal runner Walter George through to more modern legends such as Dave Bedford, Seb Coe, Steve Ovett, Linford Christie and Jonathan Edwards. There is also a wealth of fascinating trivia. One of the AAA’s Presidents was the judge at Dr Crippen’s trial; another climbed the Matterhorn and swam across Niagara. Competitors at the AAA Championships have included a Nobel Peace Prize winner, a best-selling novelist, a man who took part in The Great Escape of movie fame, and a leader of the Liberal Democrat party. 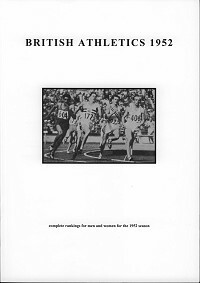 Exhaustive lists of champions in all age groups and other compilations round off a volume which is effectively a history of British men’s athletics and represents the AAA’s legacy for future generations of athletes. The first official history of the AAA was written by Peter Lovesey and published in 1980. Order this book from www.sportsbooks.ltd.uk. by IAN TEMPEST. A statistical survey of British throwing. 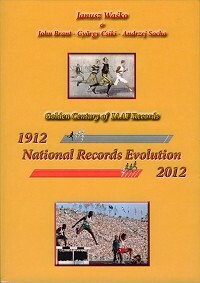 An update to this booklet covering the 2011 and 2012 seasons can be found here. 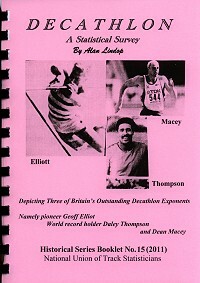 A5 book, 88 pages, full of information on the history of UK hammer throwing and hammer throwers, including progressive UK senior and U20 records, deep lists (all UK men over 50m, women over 44m) plus complete lists of UK/AAA/age group/regional championships winners, English Schools champions and all UK international performances in the major championships and dual internationals. 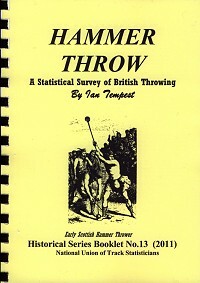 There are also features on the historical development of hammer throwing in the UK from early history onwards, Highland Games, rules and regulations and a brief history of the Hammer Circle. Also over a hundred biographies of the leading lights of the event going back to the 19th century, (to pick up the leading throwers at the dawn of hammer throwing as a competitive event) brought right up to date with the 2010 Commonwealth and World Junior medallists. A specific feature on the recent crop of younger UK throwers. or Euro or Dollar equivalent. All time rankings lists for Under 23 Mens Decathlon, Under 20 Mens Decathlon with both Junior and Senior implements), Under 18 Men, Under 17 Men (with both senior and youth implements), Under 15 Boys Pentathlon. Results of first 3 finishers in both AAA/England Outdoor and Indoor championships for all age groups, and winners of Area Senior championships. Top 10 performances in individual Decathlon events, and also top 5 performances at AAA/England championships. A full list of all Great Britain Decathlon International results, including the European Cup of Combined Events and major championships. Index of all Great Britain International Decathletes showing date and place of birth and number of Internationals competed in, including Indoor Internationals. Annual performances lists and Merit ranking lists. Deep Senior Mens Indoor Heptathlon rankings. 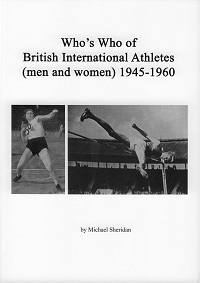 Short biographies of leading Decathletes (past and present) and miscellaneous family facts. 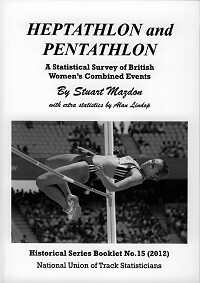 This is the 14th in the event Statistical series, others also being available from Don Turner, with Women's Combined Events (Heptathlon and Pentathlons) due next. by John Brant and Janusz Wasko, published February 2011. 100-deep women's world lists for each year in all standard events including 60 metres. Deep lists each event 1921 to 1925 now added. Major changes to quality of lists, 1926 to 1962 with much new material now added from the USSR/Sweden/Denmark/Australia/Canada and New Zealand/Austria/Netherlands/Czechoslovakia and revised deep,Germany 1939-1945 lists. Many results discovered from the African-Carribean historical newspapers of the USA, with results only published in these newspapers. If you thought the last book was good, then this is even better! 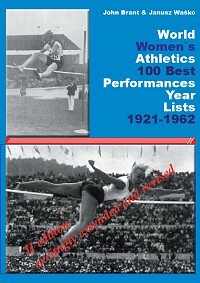 For the first 30 copies ordered there will also be the bonus of a little booklet additionally sent, with to date, the most full detailed Women’s World Games results ever published and all international meeting/matches from 1921 to 1925 with full names/full birth dates (including Monte Carlo Games 1921 to 1923). and to Kelly Holmes and Paula Radcliffe. Other parts of the world, prices on request. 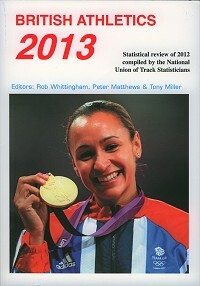 June 2013 edition now available.